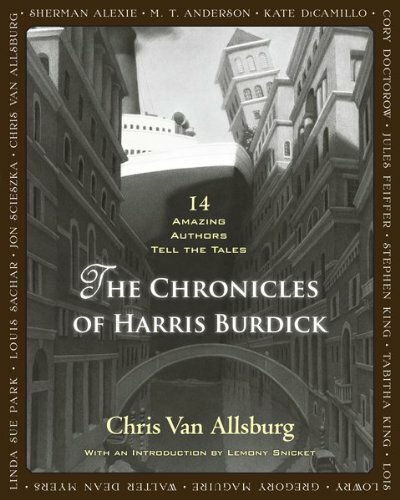 “The story of Harris Burdick is a story everybody knows,” Lemony Snicket writes in his introduction to The Chronicles of Harris Burdick, “though there is hardly anything to be known about him.” Over fifty years ago, a man named Harris Burdick appeared at the office of children’s book publisher Peter Wenders. Burdick brought with him fourteen illustrations with captions and left, promising to return with the full stories the next day. No one ever saw Burdick again. Truth be told, I wasn’t familiar with the legend of Harris Burdick, and immediately Googled him — surely, there must have been some clue about what happened to him? Turns out, he is a creation from the mind of children’s book author and illustrator Chris van Allsburg (also the genius behind the classic The Polar Express). I was somewhat disappointed at this discovery, but I was also in awe of van Allsburg’s imagination. What a marvellous idea! 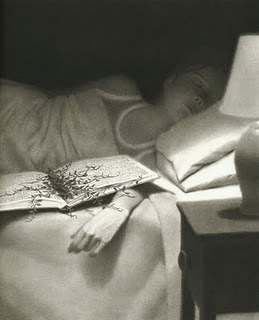 To learn more about Harris Burdick and see some fantastic stories inspired by him, go to www.whoisharrisburdick.com. 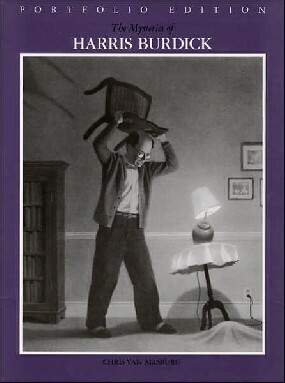 There’s also a teacher’s guide at www.mysteriesofharrisburdick.com. What is real is the amazing rush of imagination Burdick’s captioned illustrations inspire. In his 1984 introduction to the original Mysteries of Harris Burdick, van Allsburg writes, “I told Peter Wenders how difficult it was to look at the drawings and their captions without imagining a story.” Indeed, an idyllic image of children by a lake comes with the intriguing, horrific caption “He threw with all his might, but the third stone came skipping back.” An image of a harp in the woods has the caption “So it’s true, he thought, it’s really true,” which holds the promise of wonder and magic. The seemingly ordinary thriller-type caption “His heart was pounding. He was sure he had seen the doorknob turn” raises all sorts of questions with the accompanying illustration of a room with a door barely two steps high. I would love to take these illustrations to a third grade class and see the kind of stories eight year olds can come up with. I can imagine readers and writers of all ages delighting in the imaginative experience of creating the lost stories of Harris Burdick. In Chronicles, that task falls to several of the best, most imaginative authors of our time. Included are stories by Stephen King, Lois Lowry, Gregory Maguire, Sherman Alexie, Kate DiCamillo, Cory Doctorow, and the creative genius who began all this in the first place, Chris van Allsburg. Seriously, this line-up alone was enough to make me want this book, even before learning the legend of Harris Burdick. The book lives up to its promise. Put such talented writers together, provide them such inspiration and let their imaginations fly, and you end up with a wide range of really good stories. I enjoyed reading these stories, and I love how I enjoyed each story for a very different reason. Stories range from sweet to spooky and the subject matter from mundane to extraordinary. Chronicles ends with a blast, literally, with another of my favourites, Stephen King’s “The House of Maple Street.” I love how King weaves unexplained supernatural elements into a story about domestic abuse and child empowerment. The stepfather in this story is a total jerk, I felt for the mother, and I was cheering on the kids the entire time. Though it’s the supernatural elements that resolve the conflict in this story, it’s the true-to-life elements that stuck with me. Chronicles of Harris Burdick is an absolute treat. It’s a wonderful storybook, and I love reading all the stories these authors came up with. But it’s also a marvellous nudge on the imagination. Van Allsburg is right — it is difficult to see these images, especially with their captions, and not have the imagination spark with all the possibility of storytelling. Personally, I’d be fascinated to see the stories other authors would make from these images, particularly J.K. Rowling, Suzanne Collins and Arthur Slade. In the meantime, I think Lemony Snicket’s introduction sums up the experience of Harris Burdick perfectly: “As you reread the stories, stare at the images, and ponder the mysteries of Harris Burdick, you will find yourself in a mystery that joins so many authors and readers together in breathless wonder.” Breathless wonder, indeed. This entry was posted in Book Reviews and tagged Art, Fiction, Short Stories, Thomas Allen & Son, YA by Jaclyn. Bookmark the permalink. Ooh I can’t wait to read the stories you come up with, Steph! (assuming you let me, of course! 🙂 ) Definitely too bad about the New Yorker contest being open only to US residents, but this link is open internationally, I think: http://www.hmhbooks.com/features/harrisburdick/readers_stories.html I don’t know if non-US residents are eligible to win prizes or if adults are allowed to enter, but it will be cool to have a story posted on that site too, eh? Yes! It would! I’ll have to try it. And here’s something funny: yesterday I was going through the bookshelves we have for donations (books that arrive damaged that don’t get sent back to the publishers), and The Mysteries of Harris Burdick was there, the bottom corner ripped off on the dust jacket. We can’t donate that so I was able to bring it home, where it now nestles besides Chronicles. Lucky! I’ve been telling my co-workers about Harris Burdick and have at least two of them as excited about it as I am. Neither had also heard of Harris Burdick before I mentioned it, & thought he was a real person at first. Feel a bit better; thought I was the last to have discovered this amazing concept. Wait, but all those stories are by kids! Still, it would be a cool fiction exercise of my own. I have the illustrations…. This book is so fun! I’m like Steph – I bought it when it first came out (actually ordered a signed first edition from The Book Passage) but I’m holding off to read it. I haven’t even read the first yet!